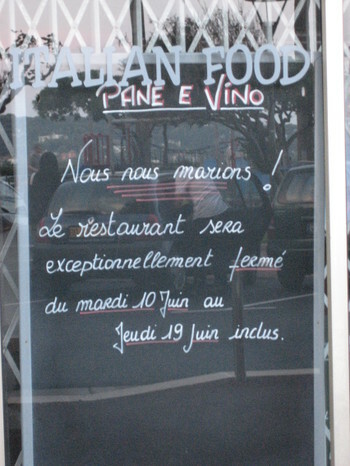 Three weeks after our return to France, we decided to take a week-long vacation where we basically just stayed local. 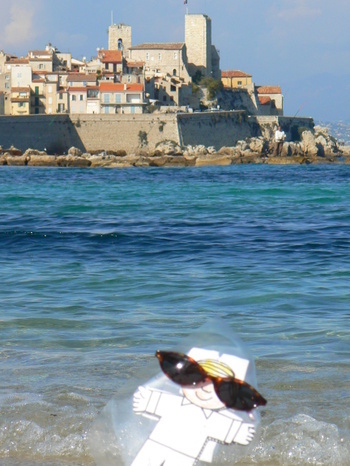 The idea was to take in a couple performances at the Jazz-à-Juan festival, which was now in full swing, soak up some rays on the beach, take some day trips, etc. One of our day trips was something that sounded intriguing to us when we had first heard about it a long time ago, but never made the effort to look into it until now. We took a trip on Le Train des Merveilles, from Nice Ville to the medieval perched village of Tende. It was an hour and 45-minute journey through the scenic Paillon and Roya-Bevera Valleys (Les Vallées des Merveilles), with a running commentary in both French and English by a lovely professional guide from the Tourist Office in Tende. We traveled through steep canyons, vertiginous viaducts, and winding tunnels, one of which was a helical tunnel which spiraled around, crossing over itself inside the tunnel. We climbed to an altitude of 1000 meters, stopping at a number of picturesque villages along the way, many of which are popular hiking destinations. We disembarked at Tende, where we hiked around a bit, taking in the views and the architecture. 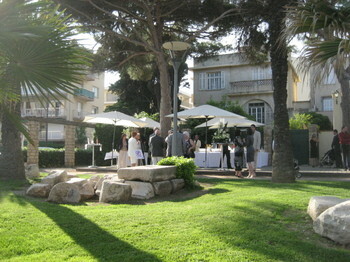 We then lingered over an alfresco lunch in the warm sunshine before checking out the Musée des Merveilles. After the museum visit in Tende, we hopped back onto the train and headed over to the village of Breil-sur-Roya, which sits beside the cool and colorful Roya River. After exploring the village, we found a comfortable rocky platform next to the river where we cooled off by sticking our bare feet into the fresh flowing water, while we watched others swimming, kayaking, and jumping from the cliffs into the river. It would have been a great picnic spot. We were not prepared to do any hiking on this trip, but the next time we go that will be our primary objective. It would be great to stop at one of the villages and do a nice hike and spend the night, then stop at another village the next day for another hike before taking the train back home. We’ll have to add this to our “To Do” list. We were rather surprised to see traces of snow on the ground in different spots that we could view from the A-8 autoroute on our way from Antibes to Saint-Tropez for President's Day Weekend. It may not have been the best weekend for our planned randonnées, but we didn't let the weather stop us from hiking and pique-niquing, even if we did have to fight a little bit of rain and hail in the process. Although, in the future I think we'll wait until later in the season before making any hiking plans in the Var. Our last randonnée in Saint-Tropez took place in June, which was really a great time of year because, not only were all the trails open and cleaned up, but we could take advantage of lots of great swimming opportunities along the hiking path. 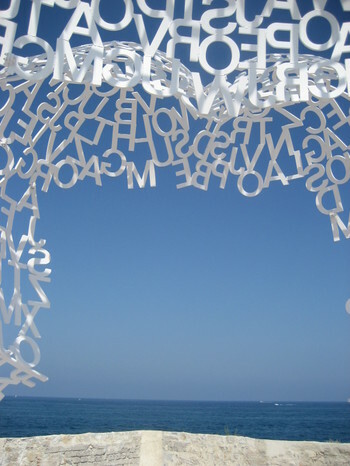 It's been a rainy, dreary, snowy winter this year in Antibes. Yes, I said snowy ! There were two days this winter where we actually saw snow here in the 2nd largest city on the Côte d'Azur. The last day of January we had snow flurries in the morning, but they quickly disappeared when the sky cleared up and the sun took over, turning into a beautiful spring-like day. But, today the snow persisted long enough to stick to the ground for the whole day, and long enough to allow us an opportunity to traipse through it foraging for photos. Our first truly summer-like day this year motivated us to get out for a randonnée along another beautiful Sentier Littoral (coastal path). This time we headed from Antibes to Cap d’Ail, which is situated just this side of Monaco – about a 50-minute drive via the autoroute. One of the first things we spotted on the hiking trail was a restaurant with a large terrace where we stopped immediately to make a reservation for lunch (Le Cabanon, Pointe des Douaniers, tél: 04.93.78.01.94). 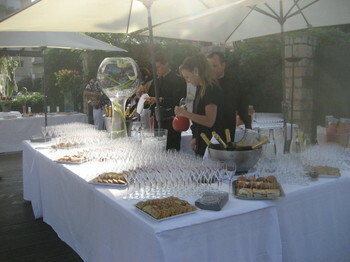 Unfortunately, they were fully booked and the earliest we could get a table was 2:30pm. This gave us 2 ½ hours to complete the 2-hour roundtrip hike, which meant we ended up doing a little backtracking, which was no problem on such a warm, beautiful day like today. It's an easy hike along a very well-maintained walkway with some ups and downs via staircases. The sentier winds all along the sea, passing by lovely villas, rocky beaches, rugged cliffs, craggy remnants of an ancient volcano, and lots of picturesque places to stop and have a pique-nique, including an Aire de Pique-Nique providing several picnic tables with shade and restrooms. I imagine they are pretty well occupied in the summer, but today there were lots of spots available. After our alfresco lunch of salade du poulpes, washed down with our first cool, crisp, Côte-de-Provence rosé wine of the year, we drove the coastal route to Latté, Italy, to do some shopping, and loaded up on some of our favorite Italian staples. We finished the day with an antipasti platter for dinner, accompanied by a bottle of Barbera d’Alba vino, and a Woody Allen movie, “Vicky Cristina Barcelona”, which brought back memories of our trip to Barcelona of just a week ago. It's great to be back on the Côte d'Azur. I like this time of year because there is normally lots of sunshine and not much tourist traffic. With the holidays behind us, everyone is back to their normal, everyday January routine: building sandcastles, selling & buying truffles, attending Hawaiian luaus, etc. 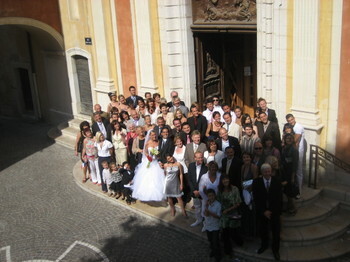 I stayed with Daniel's aunt and uncle, who live in Antibes, France. 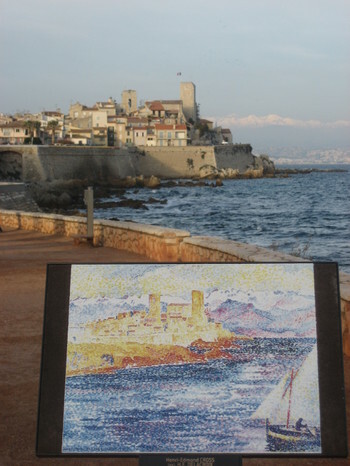 Antibes is in the south of France on the French Riviera. I had fun floating on my back in the Mediterranean Sea. 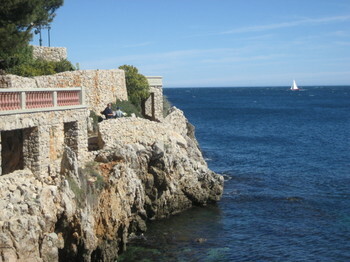 Here you can see the castle where Picasso lived and worked. 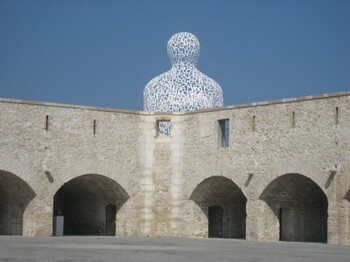 Now it is a museum with many of his famous works of art. 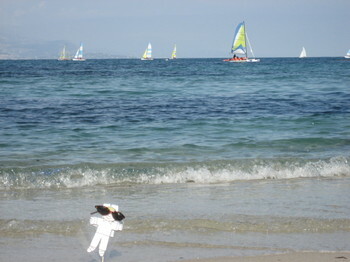 I enjoyed walking on the sandy beach, and watching all the colorful sailboats. 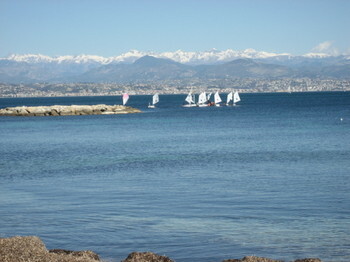 Sailing is a very popular sport here in Antibes. Sometimes I got tired from all the walking and sailing and swimming. 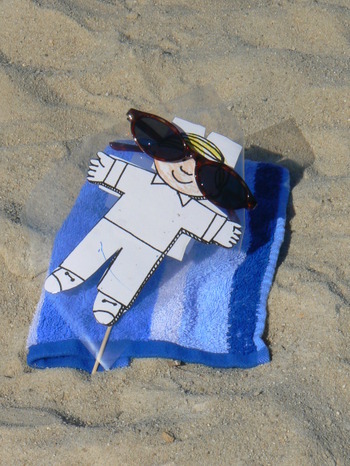 It felt nice just to lie on the beach and relax with the other sunbathers. Sometimes there are jelly fish in the sea, but I didn't see any on my visit. 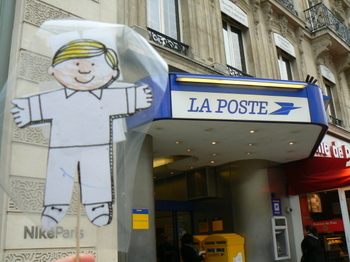 We took a very fast train from Antibes to Paris. Sometimes the fast train goes 250 kilometers an hour, which is about 150 miles per hour. 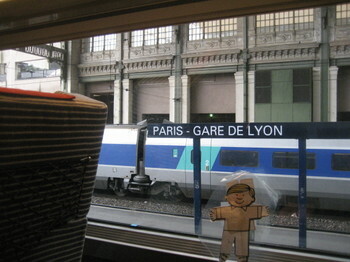 It took 5 hours to get to Paris from Antibes, but it didn’t seem that long because we had a picnic on the train, and it was a lot of fun. In Paris we stayed in an apartment in a neighborhood called Montmartre. 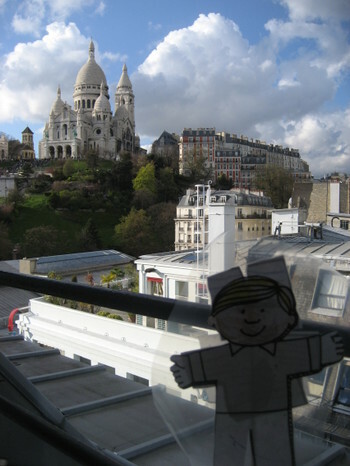 We had a view of a famous church called Sacre Coeur right from our window. The church looks like a giant wedding cake. 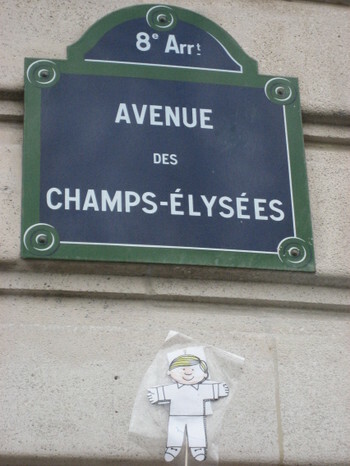 We walked along a famous Parisian boulevard called the Champs Élysées. 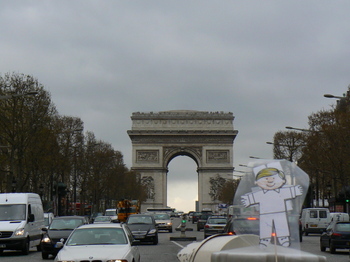 At the end of the famous boulevard we saw a huge monument called the Arc de Triomphe, which is 164 feet tall, and you can climb to the top of it. 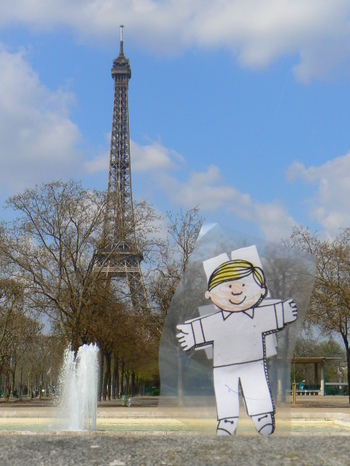 We also visited the Eiffel Tower, which is 1,051 feet tall. It used to be the tallest building in the world until the Empire State Building was built in 1931. Then the Empire State Building was the tallest building in the world. 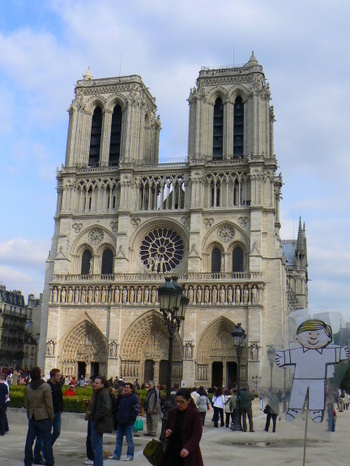 We went to an island in the middle of the river in Paris to see a church called Notre Dame. There is a really good book and an old movie about the church called “The Hunchback of Notre Dame”. 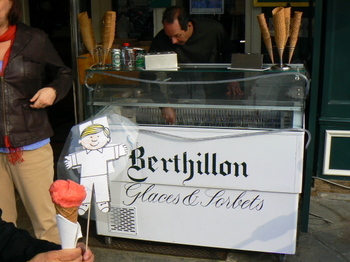 After all our walking and sightseeing in Paris, I got really hungry, so we went to another little island in the river in Paris where we found delicious ice cream in lots of different flavors. It was really refreshing. 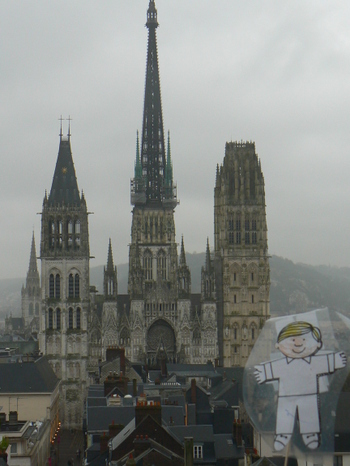 One day we took a train from Paris to a city in Normandy called Rouen. This is where we saw a famous church that has been in lots of paintings, especially by an artist named Claude Monet. This is the airline I used to fly to France. I had to get prepared to fly back home to California. 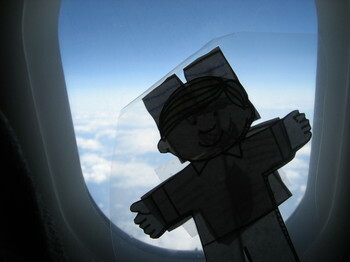 After a wonderful vacation in France, I had a great flight home. And I had a window seat this time !! 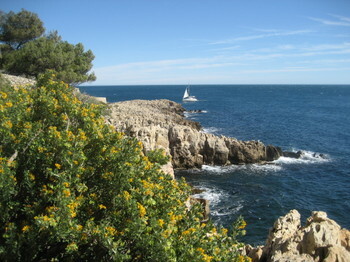 One of the many nice things about living in Antibes is that we can pack a couple sandwiches, a couple bottles of water, walk out our front door at any time of the year, and take a beautiful hike around the Cap d'Antibes, along the mostly groomed Sentier Littoral – no driving, no hassle. 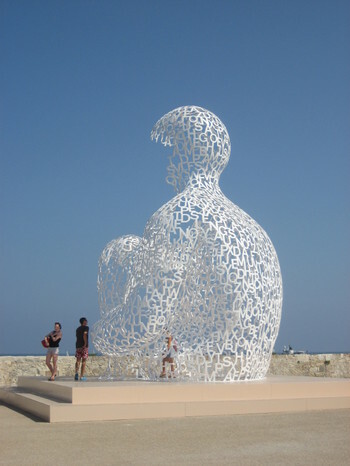 It takes us 30 minutes to walk to the official start of the randonnée at Plage de la Garoupe, and from there it takes about two hours to complete the loop. 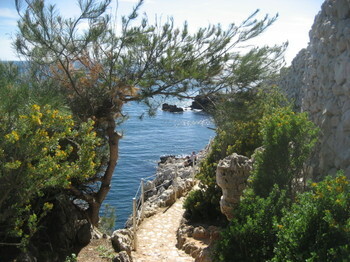 The official name of the path is Sentier Touristique de Tirepoil, and it doesn't actually go around the whole Cap, but around a portion of it from the Baie de la Garoupe, around Cap Gros, and to the Château de la Croé near the Villa Eilenroc. It's at this point where you lose the coastline and have to turn inward if you want to do the loop. If you hit it right, you can do a tour of Villa Eilenroc before you continue on with the hike. Unfortunately, their hours are pretty limited – Wednesdays at 9:00am and 1:30pm – so, we have never hit it right. There are lots of scenic spots along the trail to stop for a picnic and to take a swim, although, the water is a bit cold this time of year, so we didn't bother to wear our swimsuits today. We finally made it to the Nice Jazz Festival, after we had been talking about going since 2003. The setting was magical in the hills of the peaceful Cimiez neighborhood of Nice, among the Gallo-Roman ruins and the groves of olive trees. Our tickets gave us access to the three stages where the music continued all evening. We were handed a program when we entered so we could keep track of who was playing when and where. We started the evening on the terrace of a Festival café, where we had a light niçoise dinner while listening to Randy Crawford and Joe Sample on the piano just next door to us among the olive trees in the Scène Jardins. Then we wandered over to the Scène Matisse to listen to some Socca Jazz before heading to the Scène Arènes to listen to Sonya Kitchell. 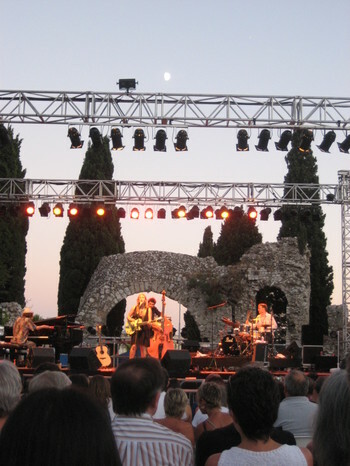 The main attraction for us was Madeleine Peyroux, who played in the ruins of the ancient amphitheatre of the Scène Arènes, where we got excellent seats for her performance. The ambiance was sensational, even if her performance was a little slower than we prefer. Things picked up quite a bit afterwards over at the Scène Jardins where we caught up with Laurent Voulzy performing his popular Rockollection song, with everyone singing and dancing along.